I will post a photo of what I have, so you can imagine what it was like. 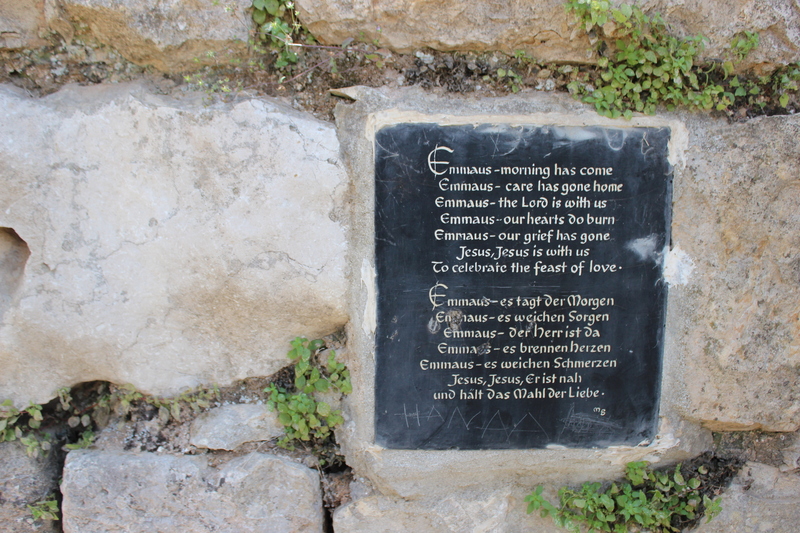 It was located in Emmaus, a neat-o place in the Bible where I believe the men saw Jesus walking, but didn’t realize it was him until he was gone. 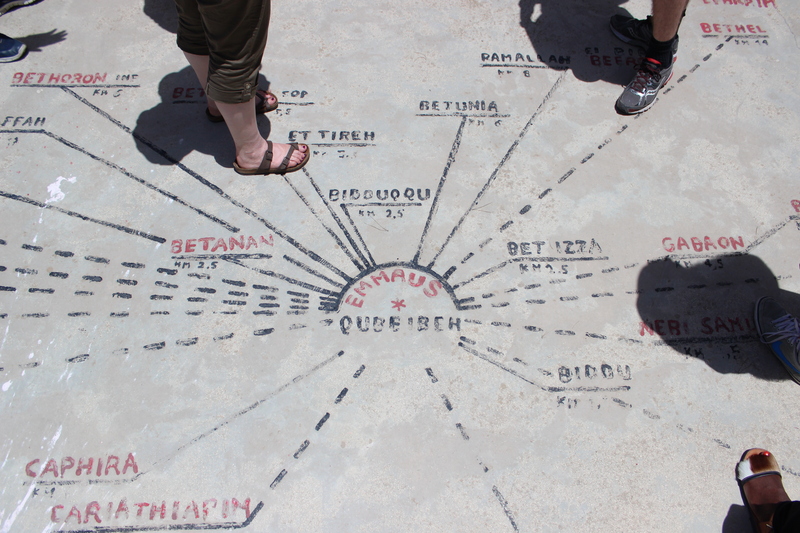 In the afternoon heat, we toured the church grounds and looked at a map showing the distances of the different cities, from where we were standing. We even saw some stones that could actually be a road like what Jesus had walked on! [Insert that ‘Wut’ lady here]. It was a cool moment. Now that I am back, people ask me how my ‘Spiritual Journey’ was. Internally I roll my eyes, but externally I thank them for remembering I went to Israel and I explain that I was there to meet people and help out where I could – not really a spiritual journey. 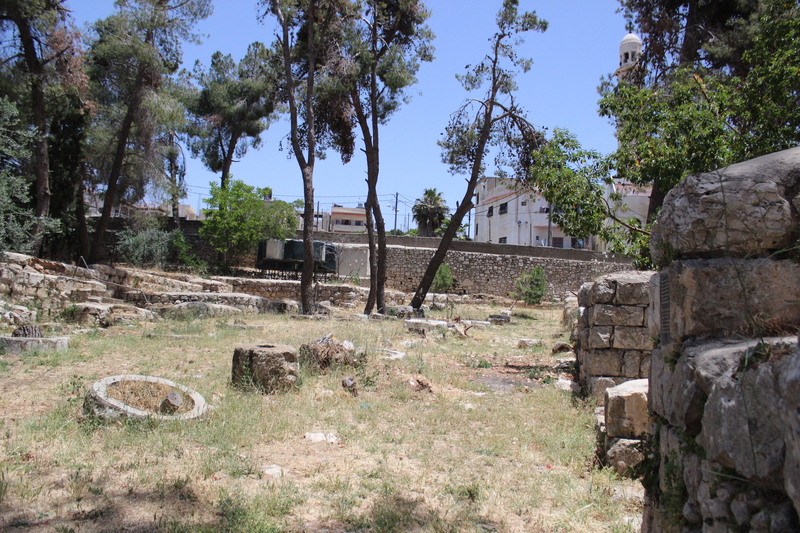 That being said, if the trip was a religious pilgrimage to the Holy Land, this place probably would have been the best part of my ‘Spiritual Journey.’ The priest and caretaker of the church was the kindest man. At first I thought he was a tourist flying solo, or the cleaning guy, but nooo he ran the church. He is from France so I even got to speak a bit of French with him. Before meeting him, a few of us were still outside while the rest of our group went inside. On my way through the door, my Palestinian friend suddenly appeared and showed me that he had a little female sparrow in his hand. I may have screamed really loudly because it tried flying out of his hand, and it may or may not have echoed obnoxiously through the whole giant church while the others were trying to pray. Hah.. I was able to hold the little bird closely and fragilely so she wouldn’t fly away, and so that I could protect her from the sun and from hurting herself further. Technically, she probably only saw two giant hands crushing her in 35 degree heat, was dying inside and couldn’t even fly anymore, but I like to think I calmed her down. Ignoring that, we put her down on a rock in the shade and she eventually hopped away happily. Just kidding she scuttled away so fast in fear and we lost her. Oh well, we did our best. From there we entered the cool sanctuary and enjoyed the peace that the large, but quiet, space had to offer. Upon arriving home, there was one moment that I needed to remember the fragile bird, and God revealed it to me well. It was nighttime in Vancouver and the rain had just started to come down. I didn’t have an umbrella in my hand, but instead a bouquet of flowers. I was wearing a light summer dress and was standing directly under a street lamp, as if the moment couldn’t be anymore dramatic. While I waited to be picked up, I felt so heavy with sadness, I feeling I hadn’t felt in a long time. In the moment I began to pray and try and give what I was feeling to God so I could begin to feel lighter. God showed me the image of the bird in my hands, and I realize that the way I held the bird is exactly how God would hold me. He would hold me close, with delicate care and he would protect me. The image immediately brought me peace and I honestly did feel lighter. 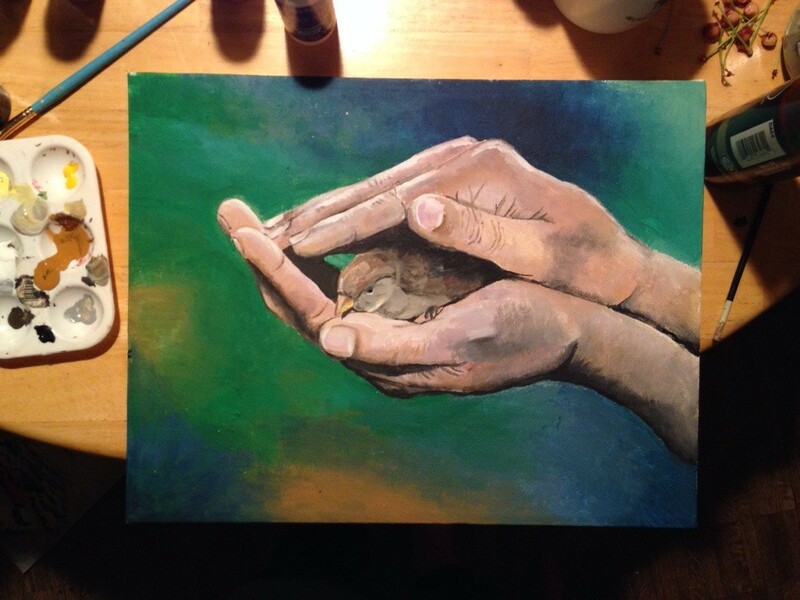 In honour of both those moments, in Emmaus and in Vancouver, I painted a picture of hands gently holding a sparrow. I added a pic of the painting to the bottom of the post. “Are not two sparrows sold for a penny? And not one of them will fall to the ground apart from your Father. But even the hairs of your head are all numbered. Fear not, therefore; you are of more value than many sparrows.” Matthew 10: 29-31.